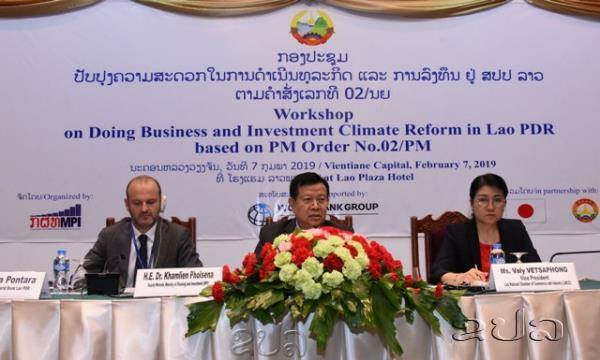 (KPL) Representatives of the Ministry of Planning and Investment, the Lao National Chamber of Commerce and Industry (LNCCI) joined in Vientiane those from the private sector to discuss recently implemented regulatory reforms for improving the ease of doing business in the Lao PDR on Thursday. This meeting was supported by the World Bank Group in partnership with the Embassy of Japan to the Lao PDR. Prime Minister’s Order No.02/PMO, dated February 1, 2018, sought to introduce reforms to improve the business environment in the Lao PDR. The order was an important step in addressing downward performance of the Lao PDR in the World Bank’s annual Ease of Doing Business rankings. The Lao PDR’s rank in the 2019 report dropped, compared to the previous year, from 141 to 154 out of 190 economies. During the workshop, representatives from the private sector and government stakeholders discussed progress and challenges on the reform front, provided feedback on implementation, and charted future plans. Deputy Minister of Planning and investment Khamlien Pholsena noted that the active participation of both public and private sectors are necessary to move to an environment that is more conducive to doing business, “The public and private sectors need to work together to implement the recent reforms and identify other areas that are barriers to investment in the Lao PDR. We hope to achieve the goal of raising our ranking to double digits in the coming years,” said Mr. Pholsena. In recent time, the government has achieved some encouraging results including simplifying enterprise registration, making easier to get an electricity connection, and improving trading across borders processes by reducing the time and number of procedures, and making information available and accessible for the public.